Spend five minutes talking with me about my freelance writing and editing career and you realize I emphasize that I own a business. Want to make it as a freelance writer? Don’t think of yourself as “just” a freelance writer; you are a business owner. One of the many reasons I love attending the American Society of Journalists and Authors (ASJA) annual conference in New York City every May is because I’m surrounded by people who agree with this idea. I love nerding out over writing and the writing business with these wonderful people. The most successful people I’ve met through ASJA strongly believe in treating their career like a business. They don’t pitch and take assignments without clear goals, a vision for their career, and a networking and marketing strategy. 1. You need a unique elevator speech. Having an elevator speech is talked about so much in the business world that it almost sounds cliché. But a great session on personal branding reminded me that I don’t have a memorized, second-nature elevator speech. Saying you are an “experienced health writer” is not unique enough. And saying on your Twitter bio that you are a “mom, soccer fan and tech nerd” doesn’t make you stand out. Social media coach and journalist Jennifer Gaie Hellum challenged attendees to know their authentic, unique self. We all say we’re storytellers. We all say we’re curious. But what makes us stand out? She recommended using the Keirsey Temperament Sorter to identify your talents. Then analyze how those talents have brought you success. 2. You need to improve your negotiating skills. Unless you’re one of the approximately five writers who are great at negotiating, you need to work on this skill. Negotiating pro Devon Smiley told us to Prepare, Practice and Persevere. Prepare by asking yourself what the lowest amount you would take is. But also consider other factors. What does the other person want and need? Negotiating is not always about money. Maybe you can get a longer deadline or ask for fewer discussion calls on a project. Practice by starting small. Ask for a change in your Starbucks order or what’s on the menu at a restaurant. Collect these wins and you will start to feel more confident about asking for what you want. Next, Persevere. If you hear “yes” to your first proposal, you’ve sold yourself short, Devon says. Embrace the no. Say “no, but …” to keep the negotiation going and ask for what you want. 3. You need to establish rules and systems to maximize your time. I love systems and productivity hacks, so it’s great to learn new ones while also being inspired by someone’s career. After her galvanizing keynote—“The Woke and Sustainable Writer”—Andrea King Collier’s session on gridding became a master class in making each story fee work for you. Among the lessons: Grid your story idea. This means map out how many different stories and venues you can write for from one interview. If I interview an expert on a health condition for a physician society’s magazine, I could ask him other questions in order to write a consumer-focused story for a women’s magazine. And maybe I could focus more on him to write a profile for his alumni magazine. Three different potential fees and clips from one interview. More advice: Write faster. Andrea said one hour of reporting should equal about one hour of writing. Know what your hourly rate is even if you never tell anyone and stick to it. More Andrea advice: Give the editor what they are paying you for. Don’t over-report. Don’t turn in a $3,000 article to make $300. My opinion: You think you’re doing the story justice? You’re allowing yourself to be used. 4. You need to pivot. When Jenny Blake started her fascinating and lively keynote, I realized she was talking about me. Jenny is the author of “PIVOT: The Only Move That Matters Is Your Next One.” Pivoting is not just about your next career; it’s not always about making a huge move. I am constantly thinking and daydreaming and planning about where my business is going next. In just four years with MelEdits, I’ve embraced new types of writing and editing and cut back on other types of projects. I embrace the pivot. Jenny encouraged us to think of ourselves as “high-net growth” individuals—these are people who are always growing, always learning, always trying something new. They will pivot more. That is how you flourish and build your business into something you love doing every day. Identify your sources of strength and ability. But also what you love to do. Just because you’re good at something doesn’t mean you love it. When are you most in the zone? When does time fly? Is it writing blog posts or interviewing people about tech? Or maybe it’s when you’re teaching other freelancers or giving public presentations. Focus on those loves and strengths. What does success look like in one year from now? (Jenny says forget the five-year plan; life moves too fast for that.) Now, look for projects, people, skills, classes that all relate back to that. 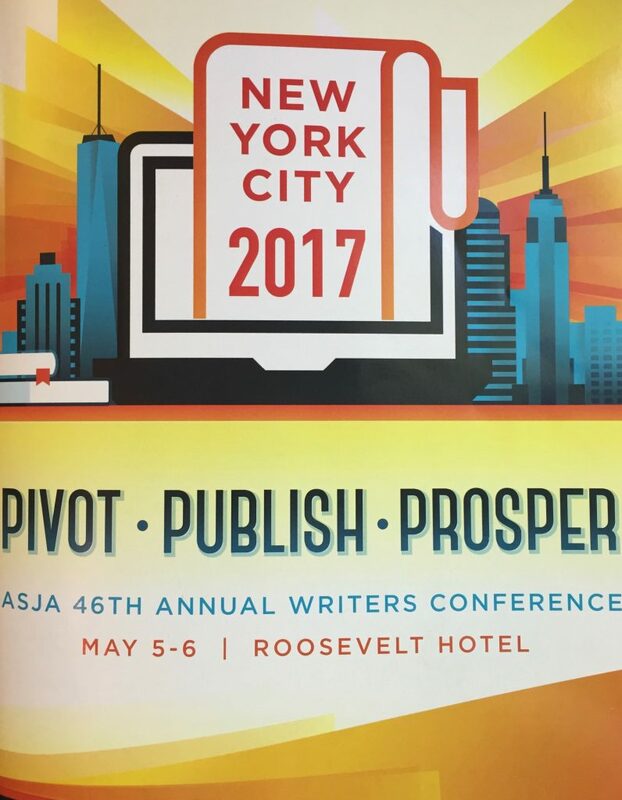 What did you learn at ASJA? What are you working on in your own business? Share your thoughts in the comments below.